But the problem was that it wasn't quite RESONATING with my heart. What I was really feeling was SAD in hope, IMPATIENT in distress, and at a LOSS FOR WORDS in prayer! So as I dug around, he reminded me that the guy who wrote this had been shipwrecked, beaten, stoned, imprisoned, hungry, cold, naked, and in constant danger (2 Corinthians 11). That's alot of struggles, but honestly, none I can really RELATE to. You mean Paul "WORRIED" about those he loved? That his heart was HEAVY for them? That he was spiritually and emotionally INVESTED in their well-being? You mean he was a man JUST LIKE ME? YES, YES, YES, and YES! YET, every word out of his mouth was full of POWER, not PITY...full of LIFE, not LAMENT. In the "DAILY PRESSURE OF MY CONCERN" for those that I love! But then Jesus spoke something that RESONATED with my heart and REALIGNED my perspective. He said, "I never identify a STRUGGLE to promote SELF PITY...I do it to PERSONALIZE my POWER!!" THAT was the key right there...that's how Paul did it! Even though he was naturally FLAWED, he was Spirit FILLED! And the TRUTH is...so am I! I can do ALL things through CHRIST who strengthens me, because HIS POWER is PERSONAL in ALL things...even THIS! When our NEED is SPECIFIC...so is HIS WORD! When our STRUGGLE is REAL...so is HIS STRENGTH! When our BATTLE is PERSONAL...so is HIS POWER! Because it's the TRUTH that really sets us FREE! Sometimes I get these strange "pictures" that help me see things a little more clearly. Kind of like little personal "parables", I guess. Over these past few weeks I have watched so many people I know and love experience unimaginable loss, hardship and pain, begging the question: "God, just WHERE is one supposed to PUT ALL THAT??" So a couple of days ago, I was pondering that question, when out of the blue, HE downloaded the answer in the form of a picture. It brought some clarity and understanding to the "baggage" we take with us on our Journey of Suffering...the difference between SORROW and SADNESS. SADNESS is a necessary emotion...but SORROW is an unnecessary burden. SADNESS labels one's circumstance...but SORROW labels one's condition. SADNESS sheds tears (sometimes enough to fill a bucket)...but SORROW tears us up. SADNESS comes and goes...but SORROW comes and stays. Whether it's the DEATH of a loved one, a devastating DIAGNOSIS, or as in my case, the death of a DREAM, these places of suffering are H-A-R-D and oftentimes very DEBILITATING! I can remember the exact day almost a year and a half ago when the SORROW over my own LOSS was lifted off my shoulders and my SADNESS was given its RIGHTFUL place...BEHIND me, not ON TOP of me. In the days that followed, I was still SAD (and still am! ), but SORROW no longer RULED OVER me. It no longer DEFINED my actions, DICTATED my conversations, or DESTROYED my confidence. I felt released to embrace and carry ALL the fullness of JOY, without being tethered to and bound by SORROW. That was the day I realized it was not the SADNESS that was holding me back and stealing my joy, it was the SORROW that I was carrying ON MY BACK! That was a LIFE-giving and LIFE-altering revelation straight from the Father's heart to mine! That was the day I was SET FREE from what I now understand was a BURDEN of SORROW! But it wasn't until just a few days ago that I got this "picture" as a gentle reminder to myself, as I am so often tempted to pick up that burden AGAIN! SORROW and SADNESS are like the "BACKPACKS" we take with us on our Journey of Suffering. They are where we pack, store and carry all the stuff we take on this journey. And sometimes we pick up some extra "souvenirs" along the way (lies from the enemy, shame, anger, bitterness), which just add more weight and make the journey all that much more cumbersome. One has STRAPS...the other has WHEELS. SORROW has to be carried on our shoulders...but SADNESS can be pulled behind us. SORROW misaligns and changes our posture...but our POSTURE is what aligns and changes our SADNESS. SORROW doesn't allow any room for JOY...but SADNESS takes its RIGHTFUL place and allows JOY to rest on our shoulders. SORROW crawls into bed with us at night...but SADNESS goes to bed in another room and allows us to get REST. BACKPACKS are a necessary part of any long journey. But research has shown that using a backpack with WHEELS to transport our "stuff" is far better for us than using one with STRAPS. When we carry SORROW on our backs, all we can think about how HEAVY it is...how much it HURTS...how SUFFOCATING it is! And under the crushing weight of SORROW, we get BENT OVER...we get bent OUT OF SHAPE, and our eyes become fixed to the ground...on our SUFFERING. When we pull SADNESS behind us, we are free to STAND UP tall, UNENCUMBERED by the weight of our suffering. We can walk with our HEADS UP and our eyes FIXED straight ahead. We can keep our FOCUS on JESUS, our "Baggage Handler", who promised to walk W.I.T.H. us...Watchfully Interceding Transforming & Helping us every step of the way! What I have learned is that it's really okay to bring SADNESS with me on this Journey of Suffering. In fact, it's necessary. There's no shame in it. It's part of the experience. 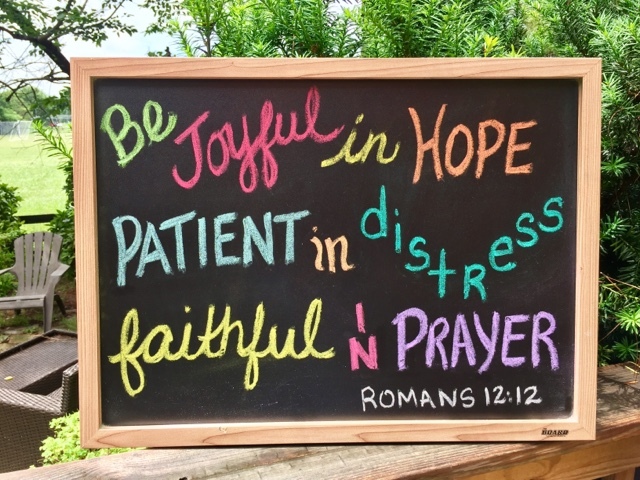 But unlike Sorrow, SADNESS doesn't have to REPLACE JOY...because as I pull it BEHIND me, my shoulders are free to CARRY the JOY OF THE LORD, which IS MY STRENGTH! SUFFERING is a trip we will ALL take at some point...it's unavoidable. It's never one we embark on BY CHOICE. It's never one we are PREPARED for or PLAN for in advance. And most of the time it takes us by TOTAL surprise. While I'm no "travel expert", I can only speak from my own experience as I have travelled this journey of LOSS...and that is, a BACKPACK WITH WHEELS is the ONLY way to go! But WHAT IF you are stuck in the middle of that journey RIGHT NOW and are just now realizing you have the WRONG BACKPACK?! It's simple...TRADE IT IN and get one with WHEELS! As I write this, I am reminded of this familiar song..."I'm TRADING my SORROW, I'm TRADING my PAIN, I'm laying it DOWN for the JOY of the Lord...and I say YES, YES, Lord! Amen!" It's really a SUPERNATURAL EXCHANGE...one that has the power to CHANGE us...EVEN IN THE MIDST of our SUFFERING! Oh, yeah...and one more thing: Never travel ALONE! Because whether you're on a CRUISEship or a HARDship, the trip is so much BETTER with faithful FRIENDS! The TRUTH is...it's not only my future hope, but it is also my present reality! It's where my citizenship is...today! It's where I am seated...today! It's where my heart is set...today! By FAITH, it's where I make my HOME...today! JESUS: Come on in, Karen...MAKE YOURSELF AT HOME! JESUS: I am the living water. If you drink of ME, you will never be thirsty. This water I give you will become a spring of water, welling up to abundant, eternal life! Me: Oh, Jesus...give me THIS water, so I don't have to keep drawing from "other wells"! JESUS: You look a little weak...Are you hungry? Me: Yes! I can't seem to get enough to eat these days...nothing seems to satisfy me...I'm always SO hungry! JESUS: I am the Bread of Life...He who comes to me will NEVER go hungry and he who believes in me will NEVER be thirsty. Also, something I learned a long time ago is that you cannot live on bread alone, but on EVERY WORD that comes from the mouth of God! Me: Oh, Jesus...from now on, give me THIS bread, so I will never be hungry! JESUS: You seem so preoccupied...what's going on? Me: Well, I've been a little sad lately...you know, a little anxious. There are things going on around me that I have NO control over and it's HARD! JESUS: I understand...just stay close to me, dear one. In my presence, there is fullness of joy...Don't be anxious about anything! Together, we can approach the throne of grace with CONFIDENCE and ask our Father for anything. He WILL give you peace beyond understanding AS He is working ALL things out for your GOOD. Be anxious about nothing, pray about everything, and peace will come, I PROMISE! Me: Oh, Jesus...you make it sound SO SIMPLE! What's the SECRET? JESUS: The secret to being CONTENT in any and every situation is to keep your HEART and your MIND focused on ME. You can do ALL things through ME...I WILL give you the strength! ABIDE in ME and I WILL abide in you, I PROMISE! The truth is...Apart from me, you can do NOTHING at ALL! Me: Oh, Jesus...I need MORE of YOU! I'm SO tired and burdened...where can I find REST? JESUS: Come to ME, you who are weary and burdened, and I WILL give you REST! Take my yoke upon you and LEARN from me, for I am gentle and humble in heart, and you WILL find rest for you soul, I PROMISE! Can I LIVE here NOW and FOREVER?? JESUS: ABSOLUTELY! You have been raised WITH me and are NOW seated with me at the right hand of our Father, far ABOVE ALL rule, power, and authority! ALL things are under my feet! IN ME, THIS is your PRESENT REALITY and your FUTURE HOPE!! Me: Oh, Jesus...I want to be WHERE YOU ARE...BETTER is ONE day in YOUR HOUSE than thousands elsewhere! The TRUTH is...Our Father did not leave us here as orphans! He has given us a HOME, both NOW and for ETERNITY. He is SO G.O.O.D.! He is God Over Our Dwelling...when we make HIM our dwelling place, it's ALL GOOD!! This is not a TRICK…it’s the TRUTH! But the enemy of our souls continues to use one of the oldest tricks in the book to convince us that GOD is trying to trick US! Are we really that gullible too? The truth is…we are in danger of being gullible and falling for Satan’s trick ANY time we don’t believe that God REALLY means what He says! Unbelief leads to gullibility….every. single. time. It’s a perfect set up for Satan’s seduction. The truth is…the smarter we think we are, the more gullible we actually are. When we think we know better, it will actually get the better of us. Satan has made a successful career out of preying on gullible people. He can smell pride and unbelief a mile away. He is cunning, crafty and convincing…prowling around, working his “magic” to create an illusion, trying to trick us into believing something that is not really true. Every time we fall for his trick, he gains mastery over our minds, convincing us that this illusion is real. Can I just say…This makes me SO MAD...and so SAD?!! The truth is...We have to KNOW THE TRUTH in order to RECOGNIZE THE TRICK! Otherwise, we are gullible and fair game for Satan's strategy of deception. REALLY?! When and where exactly in the history of mankind has this EVER been the case? G.O.O.D. = God Over Our Deception….God Over Our Death! But the ONE thing I love the most about my dad is that he showed me the FATHER. Not in a preachy kind of way, not in a banging-the-Bible-over-my-head kind of way...He just naturally showed me the Father in every day life circumstances. As I comb back over my childhood, there are certain memories that rise to the top...I didn't see it then, but now I recognize them as defining moments...moments where my dad showed me the Father's heart...His love, His faithfulness, and His GOODNESS. Growing up in Brazil, we often spent Christmases at the beach...it was the middle of summer and it was very hot. I loved the beach, but I was deathly afraid of the waves. I was happy as a lark to stay in the shallow water where it was safe. When I was about 7 years old, my dad coaxed me to get on his shoulders and go out into the deeper waters with him, where the waves were big. He insisted that it would be fun and that there was nothing to be afraid of...so I finally decided to trust him. But there was one problem...my dad, having one leg shorter than the other, was a little unsteady on his feet without his big shoe. We slowly inched our way out where the water was up to his chest. I was perched on his shoulders, squealing with delight, when a huge wave came out of nowhere and crashed over top of us! The force of the water took us both under and he lost his grip on me. It seemed like forever...I remember panicking and thinking I was going to drown, when all of a sudden, my dad's mighty hand and outstretched arm reached in and grabbed me out of the water. My dad's arm was not too short to save...And neither is my Father's! Every time before my dad would spank me, he would say, "This is going to hurt me more than it's going to hurt you!" What was he thinking...that those words were going to comfort me and make it less painful?! Somehow, deep in my heart, I knew that to be true, even at a very young age. I KNEW it because that hand that disciplined me was ALSO the hand that I clung to when crossing busy streets...the hand that picked me up when I fell...the hand that I held every night at the dinner table as we prayed...the hand that tucked me into bed at night...the hand that squeezed me tight in a big bear hug...the hand that always pointed me in the right direction. I trusted my dad's hand because I trusted his heart! That discipline WAS painful...for both of us...but my dad did it anyway...consistently and lovingly! My dad has a thundering bass voice! Anyone who has ever heard my dad sing, will agree. He is known for his amazing voice and his passionate singing. With my dad, there's no such thing as volume control! The volume is the same whether he's singing in a group of 10 or 1000. I will confess, there were times when I was younger that I thought to myself, "I wish he wouldn't sing so loud, this is embarrassing, people are turning around and looking at us!" Sometimes, it was the only voice that could be heard...louder and clearer above all the rest. But, THAT'S my daddy's voice...that's my Father's voice! Who am I to quench the mighty thundering voice of my Father? Who am I to worry about what other people think when my Father's voice overpowers the room? God said to Job, "Do you have an arm like God's and can your voice thunder like his?" (Job 40:9) Job was trying to justify himself but God was asserting HIS ability, which Job had no control over. My daddy taught me that it's okay for my Father's voice to be louder than all the rest...it is not up to me to control the volume! Every morning on our way to school, my dad would sing "Oh what a beautiful morning, oh what a beautiful day, I've got a beautiful feeling, everything's going my way!" We would plug our ears and beg him to stop...it was early and he was too loud! But that didn't stop him! He would continue, sometimes dragging the song on and on and on...and on and on and on! When I was about 8 years old, we got a puppy...she was a sweet miniature dachshund and the minute I saw her, I named her Ginger! She was our family dog, but I considered her MY dog. One morning as we were pulling out of the driveway to go to school, Ginger ran out and got under the back wheel of our Kombi and accidentally got run over. We all jumped out of the car to check on her...she whimpered and was clearly hurt, but had no external injuries. My dad quickly carried her inside for my mom to look after while he ran us to school so we wouldn't be late. His plan was to drive us to school and then to come back and take her to the vet. I went through my day at school, confident that Ginger was going to be okay. I couldn't imagine that not being the case. Just like every other day after school, my brothers and sister and I rode the city bus home. I couldn't wait to get home and see Ginger! When we walked in the house, my mom met me at the door and told me to go to their room. There sat my dad, sadder and more distraught than I had ever seen him. He took me in his lap and with his quivering voice, told me that Ginger didn't make it. The internal injuries were too severe. He hugged me and told me how sorry he was. We both cried...it was a moment that is forever emblazoned in my head. My dad was heartbroken too! What mattered to me, mattered to him. What broke my heart, broke his. My dad is a man of unparalleled principle and integrity. He is truthful and honest and is a man of his word. Growing up, he taught me that lying is wrong, to let your "yes be yes and your no be no", and that it's always right to do the right thing. He didn't have to preach it, he just lived it. I grew up very secure, knowing that my dad would never make promises he couldn't keep and that he was always telling the truth. My dad has lived a life of sacrifice, doing good, and giving of himself for the good of others. As a missionary to Brazil for over 36 years, he has sacrificed a lot...but what he has gained is priceless. Thousands of people all over Brazil and other parts of the world know Jesus because my dad made a sacrifice. I see a man that has been faithful to the call of God on his life. I've thought a lot about these things over the past couple of years and have often pictured myself sharing them at my dad's memorial when God chooses to take him home. But...why wait until then? Why wait when I can tell him now? So, Dad...this is for you. I am so proud of you. Thank you from the bottom of my heart for showing me THE FATHER. I love you! On August 30, 2012, my husband made a very costly mistake. He turned left instead of right at a T-intersection after a football game...a split second decision that cost him...BIG TIME! He had great intentions, was trying to help someone, was trying to do good...trying to do what HE thought was right...but he turned left instead of right and disobeyed a "traffic official". My husband...Seriously? Transparent-Tom? The nicest guy in the world-Tom? Would give the shirt off his back-Tom? Would never hurt a fly-Tom? THAT guy? In a nutshell, Tom took 3 of his co-workers to a Titans football game. He got 4 free tickets earlier in the day from his boss and called me first to ask if I wanted to go. I declined and encouraged him to take his co-workers (bad move on my part!). They were all excited and agreed to go...a great team building opportunity! One of his co-workers was on crutches, so Tom called the stadium ahead of time to find out where the handicap drop off was, to make it easier on him. Tom dropped them off at the designated spot, and after finding a remote place to park, he joined them and they all enjoyed the game together. About midway through the third quarter, they decided to leave early, to avoid the crowds. As they were leaving, Tom stopped a stadium official to find out the best place to pick up his friend on crutches. This guy asked where he had parked, then explicitly told him what to do: Pull up to that intersection, turn LEFT, and then pick up his friends under the Letter "K". So, that's exactly what he did...Except when he got to the intersection, the traffic officials were directing ALL traffic to turn RIGHT, which would take him directly onto the interstate! He inched up to the intersection, turned his left blinker on, rolled down his window, and tried to get their attention, to explain why he needed to turn left. Here's a little side note: These traffic officials did not look like policemen...they were wearing khaki pants and reflective vests...there was nothing on them that indicated that they were POLICEMEN. For all Tom knew, they worked for the stadium. But these officials (there were 2 of them)...they wouldn't listen! They were busy doing their job, directing traffic and trying to keep order at a busy intersection, waving their flashlights, and yelling, "Turn RIGHT!!" When there was a break in the pedestrian traffic, Tom continued with his window rolled down, and still trying to explain, he inched his way further into the intersection and finally turned left. As he did, one of them ran up and slammed both hands against the side of our mini van as Tom made that left turn...yelling like a crazy man, "Turn RIGHT!!" Within seconds of turning left, Tom was surrounded by sirens and flashing lights. One of the police officers grabbed the keys out of his hands, ordered him out of the van, and yelled at him, "Have you been drinking?" Of course, he passed the sobriety test and for the next 2 hours, the officers argued amongst themselves about what to do next and what to charge him with. Bottom line, he was arrested!! My husband...Tom Clark was arrested and charged with wreckless driving (a felony) and failure to comply with an officer of the law (a misdemeanor). An officer of the law?? He sure didn't look like one! Meanwhile, I'm sitting at home, oblivious...it's getting late, so I text him..."What's your ETA, honey?" My first reaction was to be MAD..."What were you thinking?? Why didn't you do what you were told to do? I don't care what your reasons were...you should have obeyed the cops!" Our whole future flashed before my eyes...Tom with a record...he'll lose his job...no one will hire someone with a felony...this could bankrupt us...oh, and...what will people think?? My mind immediately went to the worst case scenario and I was gripped with fear and anxiety, but mostly I was really angry! It actually took me about 24 hours to get over being angry and to begin to feel some sort of compassion for him...to tune into his feelings of shock and regret, as the reality of his charges sunk in. Fortunately, that night, he was not hauled off to jail. Three hours later, he was allowed to leave, but was given a ticket outlining the charges and a court date set for late September. The next week, we hired a lawyer, who represented him at his first court appearance. We had enlisted people all over the world to pray for this court date and were confident that the D.A. would see how ridiculous this was and would dismiss the charges. Well, it didn't go our way...The D.A. looked at the police report and compared it to Tom's story and said they didn't match up, so he set another court date to bring in the witnesses, the two officers that were at the scene of the crime. That date was set for the day before Thanksgiving, November 23rd. Needless to say, we were shocked! Are you kidding?? Our judicial system is so messed up...all this time and money being spent on this ridiculous case, while the courtroom is full of drug addicts, sexual offenders, thieves, and prostitutes? On a more humorous note, Tom had to go early that day to the court, stood in line with all of the above, to get finger printed and have his mug shot taken...front and side views...the whole nine yards, just like on TV. Got the picture?! He was so out of place, dressed in his suit and tie, that these other offenders would come up to him and ask if he had a card, thinking he was a public defender! He didn't say it, but he thought it, "No, I'm an offender just like you!" It was surreal. So, Wednesday, November 23rd came, court appearance number two...Again, we had people all over the world praying and we were confident that this case would be dismissed. The lawyer asked Tom to sit outside the courtroom, so that he could address the D.A. and hopefully, the 2 officers that were present. After a few minutes, he came out, pale as a ghost and said, "Tom, I don't know how to tell you this...I am shocked...the D.A. is recommending a sentence of 10 days in jail and a 6 month suspended sentence!" He went on to say, "This is a very hostile environment, the officers are demanding and mad, and the D.A. is going in their favor. I recommend you don't take the sentence and we will remand this case to the Grand Jury." Tom, of course, was in shock, and reminded the lawyer that he is a Canadian citizen, here in the U.S. on a Green Card. A jail sentence could trigger a Homeland Security investigation and possible deportation! "That settles it, then...we will remand it to the Grand Jury." He also said that he would like to refer Tom's case to a different lawyer, someone with more influence and who was more connected in the Nashville court system. So, we hired another lawyer, one of the top names in Nashville, highly recommended by several people we knew...$$$$$$$$$$$$$$$!! Best case scenario: Using his connections, he would be able to pull Tom's case out of the queue and negotiate with a favorable DA. Worst case scenario: It would go to the Grand Jury and then go to trial...could cost upwards of $100,000 or more if it went that far. He didn't make any promises and was careful not to give us any false hope. His retainer was $10,000...so we took out a loan and wrote a check. It was 3 weeks before Christmas...Joy, Joy! We waited....and waited...and we learned very early on, not to call him...let him call us. Every phone call and every email was at least $125, whether it took 5 or 15 minutes...his rate was $600/hour! CHRISTMAS came and went, and we marched into 2013 with this thing LOOMING over us. It was in January, in the midst of all this and several other hard things, that God gave me the word: G.O.O.D. The challenge every minute of every day was to take every thought captive, to not be overcome by fear and anxiety, and to focus on the simple yet profound truth: God is GOOD. I would declare it in the car, I would scream it in the shower, I would mutter it under my breath at work, I would remind him, "God, you are GOOD...you are OVER all these things. Because I know that you are OVER them, I trust it's ALL GOOD, even though it's HARD and it's SCARY! I'm not sure how all this is going to turn out, but I trust you. You are G.O.O.D...You are God Over Our Defense, God Over Our D.A., God Over Our Disobedience, God Over Our Deviations, God Over Our Drama, God Over Our Developing character...Your name is GOOD...and you are the Great I AM!" I would "hear" him say back, "I AM over all of it...trust me, stay close, sit with me, be still and KNOW that I AM GOD." That truth began to change my perception of my reality even though my reality didn't change. Our circumstances, consequences, chaos and drama were all still very present and REAL, but they didn't CONTROL me. The undeniable truth that God is GOOD, began to control me. You see, when I really believe that God is GOOD, that he is above and OVER everything that I am going through...somehow, I am able to rise ABOVE the mess, even though I'm still IN it! It's not just empty words or spiritual jargon...it's REAL! It's almost like an "out of body" experience...I can see it all happening, and know I should be anxious, that I should be going ballistic, but I am at peace! It really IS "out of body" because it is a spiritual reality, not a physical one. Ephesians 1:20 says..."God seated Jesus at his right hand in the heavenly realm, FAR ABOVE all rule and authority, power and dominion...". If God is OVER it all and his position is ABOVE it all and we are seated right next to Him, shouldn't that change our perspective...how we think...how we react...how we walk and how we talk? If our Father is OVER it all, and we are seated right next to Him, we are SAFE! No matter what is going on below...No matter what is falling apart around us...If our Father, who is GOOD and PERFECT in all His ways, is OVER it, we can sit beside Him and be still. We have a choice: Do we sit with him in the heavenly realms, far above all rule, authority, power and dominion? Do we partner with the ONE who is OVER it all? Do we choose to partake of HIS divine nature? Do we allow him to teach us, guide us, and coach us in this game of life? Or, do we choose to abandon that post and sit "below", in the mire and muck of our present reality, becoming ensnared and entangled by fear, anxiety, control, despair, pride, selfish ambition,,,? Our strongest position of power is when we are seated WITH Him in the heavenly realms...there is GREAT POWER from this perspective!! SO WHAT DOES ALL THIS HAVE TO DO WITH TOM BECOMING AN AMERICAN CITIZEN? Well, let me tell you what the MOST HIGH GOD did for us!! Let me tell you of his GOODNESS, of his MERCY, and of his FAITHFULNESS!! During the process of working out a deal with a favorable D.A., our lawyer thought it would be wise to consult with an Immigration lawyer, to make sure that the deal he was working on wouldn't jeopardize Tom's status as a Resident Alien. He set up an appointment for them to meet with this lawyer, thankfully, on his dime. During the course of the conversation, she asked Tom why he hadn't become an American citizen. He gave her lots of good reasons, mainly that he didn't want to give up his Canadian citizenship. She dispelled that myth, explaining that the laws had changed and he wouldn't have to do that; he could be both...a Canadian in Canada and an American in the U.S. But then came the question that changed everything, "Tom, do you and your wife ever plan to live in Canada or retire in Canada?" His response: "Maybe...we haven't planned that far ahead, but it's a possibility." Her response: "Well, here's the deal...If you retire in Canada and are not an American citizen, you will forfeit all the money that you have paid into Social Security over the past 30+ years...you will not be able to collect that money as a Canadian citizen living in Canada, if you are not an American." WOW!!! Seriously? How would we have ever known that? Can you imagine, being 70 years old and deciding to move to Canada to live out our days, only to find out that we didn't have access to that chunk of our retirement, money we were counting on? Needless to say, Tom began the process that day...it was a no-brainer! They had worked out a deal...To DROP the "wreckless driving" charge (a felony), and to KEEP the "failure to comply with an officer of the law" charge (a misdemeanor C, similar to a speeding ticket), in addition to a $50 fine, plus court costs. We were assured, this was a GOOD deal. He went to court on February 21st, for the third time, stood before the judge and agreed to the plea bargain and walked out a FREE man! On October 24, 2013, Tom went to court for the fourth time in one year, this time, to be sworn in as an American citizen. He took the Oath of Citizenship and said the Pledge of Allegiance for the very first time. He was one of 56 people from 33 different countries who were sworn in that day. It was a witnessed by family and friends, and was celebrated by many others throughout the day. But THAT celebration PALED in comparison to our celebration of God's GOODNESS...His Faithfulness, His attention to Details, His Mercy...His very real and tangible presence during one of the most difficult, yet most glorious years of our married life! Can God Right a Wrong? A-b-s-o-l-u-t-e-l-y! Can He redeem mistakes and wrong turns, no matter how costly? A-b-s-o-l-u-t-e-l-y! This is the TRUTH: Mistakes and wrong turns have consequences, some more costly than others...but they don't define us and they don't determine our future. Sometimes we fail to see the GOOD in our mess because we haven't included God in the equation. We've abandoned our rightful position in the heavenly realms and lost all perspective. He invites us to come and sit with Him where He sits, ABOVE the mess, where He is OVER the mess...to allow His presence, His perspective, and His truth to shape and change our perspective of our present reality, to partake in his divine nature, to have peace and to soar above our circumstances. It steals joy, kills self esteem, and destroys relationship. Anyone who has ever lived under the crushing weight of debt knows this to be true. Where there is debt, there is imbalance. Where there is imbalance, there is struggle. Where there is struggle, there is lack of peace. Where there is lack of peace, there is unrest. Where there is unrest, life becomes debilitating and depressing…and the vicious cycle continues. Inevitably, where there is debt, there is always a debt collector…one whose job is to hold you accountable. Debt collectors can be ruthless. Their job is to do whatever it takes to collect the debt…They badger you daily, keeping you in a constant state of poverty and shame. As a last resort, they may garnishee your wages, withholding the very thing you need for survival…and the vicious cycle continues. Tom and I recently had an encounter with a debt collector…unfortunately that debt collector was none other than US! Our sons, ages 20 and 22, owed us money…lots of it. For weeks, I kept an ongoing tally of what each of them owed taped to our fridge door. Two to three months ago, they both lost their jobs and were unable to meet their monthly obligations. They picked up part time jobs, but their debits continued to outweigh their credits. In an effort to “help” them, we decided to lend them money, to help cover their rent and other expenses. As parents, that’s what we are supposed to do, right? Make sure our kids don’t suffer, make sure their needs are met? All the while, we were encouraging (prodding, nagging...) them to get a second job, to do whatever it takes…deliver pizza, work at Walmart...ANYTHING! But they have a different sense of urgency than we do…taking their time…waiting for just the right job to come along. In addition, some of their values don't line up with ours and we have differing opinions regarding lifestyle choices. Therein lies the rub, the tension, the strain...the DILEMMA! As parents, we want to help, but we don’t want to enable irresponsible living. So...what was intended as HELP, soon became a HINDRANCE. We soon found ourselves in this AWFUL role as debt collectors! Who likes debt collectors? Who wants to be around them? Who wants to have dinner with someone who is constantly pointing out the debt and the mistakes? Who wants to come “home” and help himself to the fridge, when that fridge has a growing tally of his debt plastered all over it? Besides that, who in their right mind WANTS to be a debt collector anyway?? It is a gross job and it goes against every fiber of my being. When someone is indebted to you and owes you something, it’s really hard to get past that and to simply love and accept them for who they are, however they choose to live. Their debt and their inability to pay are on the forefront of every interaction. What they are doing with their money instead of meeting their obligations is a recurring theme, the proverbial elephant in the room. Confrontation and criticism replace affirmation, which leads to avoidance, which leads to apathy. Where there is debt, relationships get skewed, messed up...It's a vicious cycle...debt steals, kills, and destroys...on BOTH sides of the fence! We cannot be debt collectors and parents to our adult children at the same time! We cannot love and accept unconditionally while trying to collect debt. On the same token, we cannot expect our kids to approach us freely, when they are so indebted and unable to pay. Debt is a SATANIC setup where everyone loses...it has his fingerprints all over it! I couldn’t shake His voice…it was so strong and so overwhelming. He kept reminding me, “I'm not asking you to do anything that I haven't already done first...just DO it!” I struggled...do I tell Tom? If I tell him, then I’m committed…do I really want to do this? The silent arguing continued...What if they don’t GET it, what if they keep making the same mistakes, what if the results aren't what we are hoping for? He kept on, "None of that matters...just DO it!" So, we met with each of the boys...separately. We had prepared for each of them a list of all their debt…dates, amounts, with the grand total underlined twice. Each time, as we set the piece of paper in front of them, we could literally see the blood draining from their faces…the stress, the shame, the guilt, and the crushing weight were palpable. I don't know who was more relieved...them or us! All I can say, is it felt GOOD, it felt RIGHT, it was a HOLY moment for Tom and me. We got 2 different reactions. One responded, “Thank you…but why are you doing this? They were my mistakes, I should pay for them.” The other one could barely get out a whisper “Thank you”, through his quivering lips and tearful eyes. Was one reaction better than the other one? I don't think so. They were both appropriate…both so reflective of our human nature...that tension between pride and brokenness that we all struggle with. WHY IN THE WORLD AM I TELLING THIS STORY? It’s certainly not to air our dirty laundry or to shine a negative light on our kids! They are young, figuring it out, learning some hard lessons...that's part of growing up. I am confident that God’s got them and I’m s-l-o-w-l-y learning to release them into His very capable hands. It’s really about what God is teaching me about HIMSELF...about his heart and his character. The truth is...the debt of our sin steals joy, kills self esteem and destroys relationship. Satan wants us to live in a state of debt and in poverty of spirit. He masquerades as an angel of light, but make no mistake…He is that AWFUL debt collector! He is well aware that sin separates us from God and that the wages of our sin is death. If he can just keep us in that vicious cycle of debt, imbalance, struggle, lack of peace, unrest, debilitation and depression…If he can just keep badgering us, accusing us, reminding us of our mistakes…If he can just keep convincing us that we have to pay for our sin...then, he can blind us and keep us from seeing and experiencing the gift of grace and the unconditional LOVE of our Father. But GOD, in his infinite wisdom….didn’t LOAN us salvation...he GAVE it to us...He knew he couldn't be a Father and a debt collector at the same time! He knew that if salvation were a LOAN, we would never be able to approach him with confidence, we would never feel like we were good enough, we would avoid Him, be afraid of Him, we would try to find other ways to get out from under the debt. We wouldn’t want to come “home” and share a meal with him, to have fellowship with him, because all we would see on the his fridge would be a list of our sins. Not to mention, His heart would be TORN…wanting so desperately to help us experience the FULL LIFE, yet needing to hold us accountable for keeping the LAW…for repaying that loan. So He GAVE what was MOST precious to him…He paid our debt IN FULL with the RED BLOOD of Jesus, so we would no longer have to be in debt, bankrupt, living in the red...NO, actually dying in the red, under the weight of guilt, shame and hopelessness! By the B.L.O.O.D of Jesus, we were Brought to Life Out Of Darkness! It paid the debt of our sin, in full...forever! And when Satan comes knocking at our door...prowling around in his roaring debt collector's voice... with his list, accusing us, condemning us, trying to collect our debt, we can SLAM the door in his face and say, "Go away! My Father has FORGIVEN my debt...it's paid in full! You have NO HOLD on me!" The LIFE is in the BLOOD...Living IN THE RED is true life! But there's more...when we are living IN THE RED, His BLOOD continually Brings Life Out Of Darkness…minute by minute, hour by hour, day by day. There is POWER in the BLOOD…wonder working power…it redeems, restores, reconciles, repairs…it redirects, it rights the wrongs, it relieves pain! Debt comes in lots of packages, not just money. How about unforgiveness or entitlement? What gift of forgiveness do I need to extend to someone who has wronged me, who has overlooked me or who has not treated me as I think I deserve? Who is God nudging me to forgive, "Just DO it!"?? Do I trust him enough with the outcome? Living IN THE RED...Redeemed Eternally from Debt! I want THAT kind of life, don't you? I want to live so completely IN THE RED, so COVERED in THE RED, that the power of his blood flowing through me allows me to freely GIVE what I have RECEIVED. God is so GOOD...He is GOD OVER OUR DEBT! He lead the way by example, so that we might imitate him..."Forgive others as I have forgiven you." This is a SACRED setup where everyone WINS! It has God's fingerprints all over it!